Come make things with us. 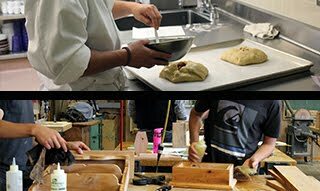 Educational programs which feature fabrication of objects in wood, metal, or food using a variety of hand, power, or machine tools. If you like to cook or would like to learn how, this class is for you. Class begins with a review of the basics: equipment, safety, reading a recipe...and will quickly move on to making various foods. Foods cooked will include: cinnamon rolls, muffins, pretzels and scones to go with soups, salads, pies, pizza, and cookies. You'll learn how to put foods together like a chef to make a great looking and tasting dinner. You will also begin learning the skills needed to be part of the exciting world of the food service industry. An introductory study of the tools, machinery, materials and methods of woodworking. Nine specific projects are required Students are required to pass a written safety and practical safety test. Wood I cannot be repeated for credit. females in an alternative to the traditional shop atmosphere. This course cannot be repeated for credit. This is a required 9 week freshman technology class. The class switches with Frosh Tech. The course gives the student an introduction to technology/engineering related fields. Major projects include board drafting, computer 3D drafting, a technology speech, robotics, and building a catapult. Students will also research careers that reflect interests, pathways and post secondary options. menu items to ensure profitability, and marketing menu items. This course is intended to successfully prepare students who plan on either majoring in agricultural sciences or culinary arts at a college or university and/or go directly into the agricultural or food service business. Students select, design and build projects in accordance with their abilities and interests. Experimentation is encouraged in design and technical skills used. Students are required to pass a written safety test. May be repeated for credit with a grade of “C” or better.